Suddenly, there's so much new growth, and a lot of it is a bright, acid green. Here's a snapshot of my very green garden today. 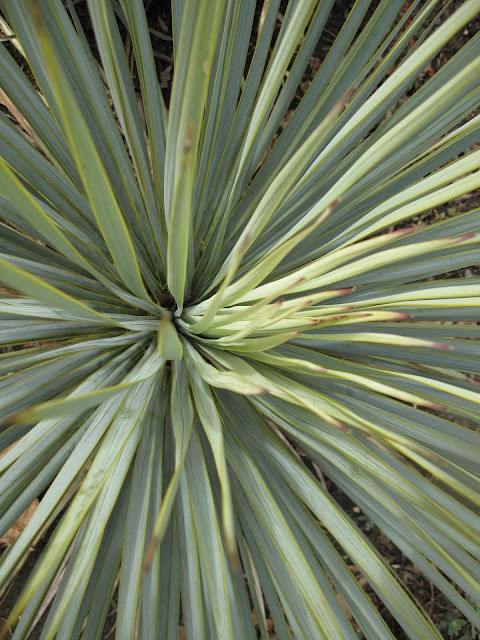 Yucca rostrata has beautiful hints of chartreuse in its new central leaves, and a subtle edging of it along the older leaves. Asplenium trichomanes, acquired from Far Reaches Nursery on Plant Nerd Night. It has yet to find its perfect spot in the garden. Of course, not all spring growth is chartreuse. Here's the fuzzy, silver strangeness of my oldest Syneilesis hybrid erupting out of the ground. I love this stage of Shredded Umbrella Plant. Lots of new culms of Fargesia robusta promise increased privacy for us this year. And what would spring be without a tulip? These bright, tiny species tulips (Tulipa dasystemon) remind me of sunny side up eggs. It's the perfect hit of color to mix with chartreuse on a sunny spring day. As so often happens in March at the gardens of Longview Ranch, a lot of plants are almost in bloom. Since I worry that they'll be open and gone by the middle of April, you are going to see some serious buds along with my flowers this month. First, an indoor bloom I've been enjoying this month. For the first time, Clivia Belgian Hybrid Orange is sporting two bloom trusses! 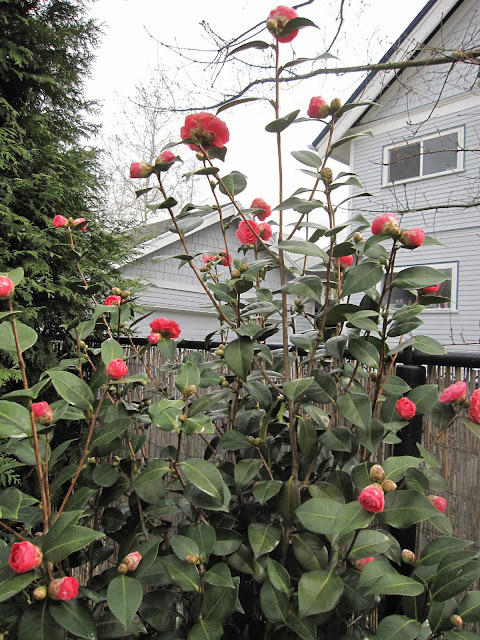 This year, Camellia japonica 'April Kiss' is at her best yet. Lack of major, drenching rainfall means we get to enjoy the blooms of all the camellias much longer. Planted for privacy, she crested the fence last spring and has added at least a foot of height over the past year. 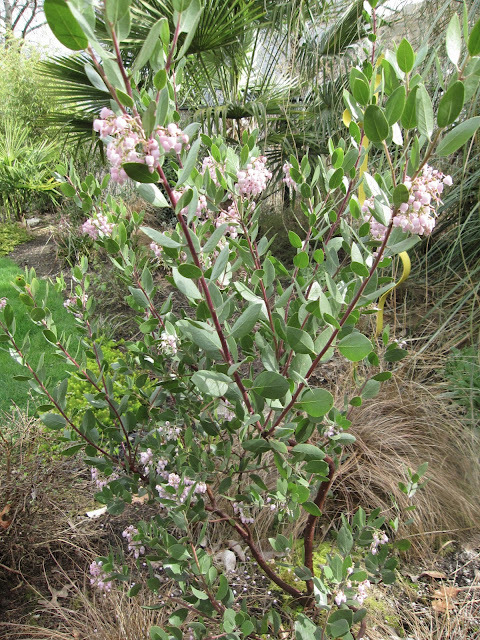 Arctostaphylos 'Austin Griffiths' is now in full bloom. It seems like a good spring for all the manzanitas I've seen this year. My NOID Hellebore looks so much better after I wised up and took off the old foliage. Now I can see the flowers! Here's one of those major buds I mentioned: Rhododendron 'Shamrock' hasn't quite got its act together for St. Patrick's Day, but it's working on it. A lovely Primula from Ryan in our fall plant exchange. Oxalis 'Ruby Slippers', from Cistus Nursery via Plant Nerd Night this past Friday. I might like the blossoms of our native Mahonia aquifolium best at this stage, when they have a blush of red just before opening. Sarcoccoca hookeriana var humilis is still covered with blooms, but the scent is not as strong as they age. Carex morrowii 'Evergold' has these funny, hairy little brown flowers. The red and pink inherited Camellia japonica are in full bloom. Rosemary 'Bonny Jean', contrasting nicely with the brick planter it lives in. Tulipa hageriana x aucheriana 'Little Princess' - yes, in bud. Evergreen Huckleberry - almost open. Mahonia nervosa is still in bud. I love the contrast between its bright yellowy-green flower buds and its seasonal red stems and purple leaves. Bloom Day is hosted monthly by Carol at May Dreams Gardens. Pay her a visit to see what else is blooming this Ides of March. Happy Bloom Day!